Leading Manufacturer of ptfe coated glass fabric conveyor belt and fusing press conveyor belt from Ahmedabad. With the aid of modern machinery and ultra-modern technology, we have been able to manufacture PTFE Coated Glass Fabric Conveyor Belt. Our offered belts are developed in variegated designs and sizes to meet the diverse demands of clients. Creating new benchmarks in the industry as an eminent manufacturer engaged in offering our clients with Fusing Press Conveyor Belt. At our end, we manufacture these belts utilizing quality-assured components that are obtained from the credible vendors of the market. 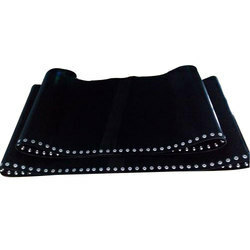 Besides, these belts are offered in customized forms as per the needs of clients.